Happy Halloween, Francisco Park supporters! Momentum to create and build the new Francisco Park continues! In recent weeks the Francisco Park Conservancy and the park’s design team met successfully with the San Francisco Planning Department, San Francisco Recreation and Park Department, as well as the San Francisco Art’s Commission’s Civic Design Review Committee who unanimously approved the latest schematic design submittal. Significant city review meetings and an additional community meeting are upcoming. Details to come soon. We appreciate all of the support we have received thus far! Many potential challenges of a public park can be alleviated at the design stage. 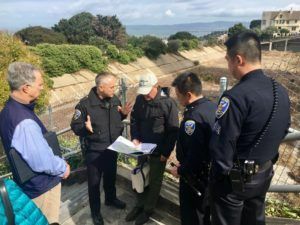 FPC has sought early and continuous feedback from the SF Police Department to get their input on how the park’s design can facilitate access, regular patrol, and enforcement. On October 20, FPC team members met with Commander Lazar, of the SFPD Community Engagement Division, his deputy, Officer Lee, and Captain Yep, who leads our local Central Station. Topics discussed with SFPD included how to discourage encampments and other loitering, strategies to ensure the park bathrooms are safe, and how to engage with SFPD and other community leaders to activate the park once it has opened. The Francisco Park Conservancy looks forward to continued discussions with SFPD and the community to help ensure the new park is as safe and enjoyable for everyone as possible. The Francisco Park team has worked diligently to put together a team of experts who will build the safest, most sustainable park possible. As you read in last month’s newsletter, we will be featuring each of our team of experts in upcoming newsletters. This month, we’re thrilled to introduce Randy Burkett Lighting Design. 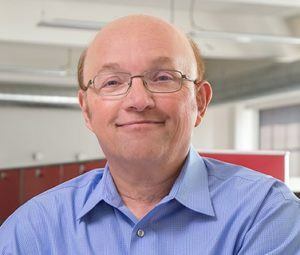 Randy Burkett has been an award-winning expert in lighting design and strategy for more than 30 years. His impressive portfolio includes work across the United States, including the Martin Luther King Jr. Memorial in Washington, D.C., the Utah State Capitol in Salt Lake City, and Citygarden in downtown St. Louis, Missouri. As he began his work on Francisco Park’s lighting and safety design, Burkett emphasized his goal of making the park safe through layered, strategic illumination. Illumination will emphasize safety and security, while providing a lighted environment that enhances both the park’s natural beauty and landforms. Some special lighting elements will be integrated in specific areas that will benefit from additional attention after dark as part of the park’s proactive safety measures. A heightened sensitivity to issues of light trespass, sky glow and nuisance glare will be a cornerstone to the project, so as to mitigate impact of light pollution. Aspects of the park’s storied history will also be subtly revealed after nightfall. FPC is proud to be working with Randy Burkett Lighting Design to make the park as safe and welcoming as possible. For a full list of the Francisco Park Conservancy’s team of experts, visit our website here. Stay tuned for more design team profiles in future newsletters. 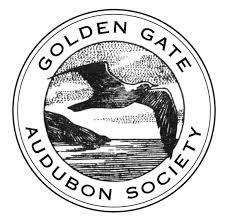 Last year a volunteer from the Golden Gate Audubon Society completed a year-long bird survey and found 59 different species present on the Francisco Park property. Birding by others at the future park site has continued and, at present, 60 different species representing hundreds of birds have been recorded on and around the site. Some of the beautiful and exciting highlights included Cedar Waxwings. Red Tailed Hawks, Anna’s Hummingbirds, many species of warblers and two species of the notoriously voluble Jays. As this park has a very limited habitat to support bird life at present, these numbers bode very well for a teeming, dedicated, wildlife area when the park is completed!